These weight indicators can be fitted and calibrated to any of the following Weigh Beams , Platforms or U Frames. Please note that the letter of your chosen indicator will be at the end of the model number: IE SSLPPS - C <C is the indicator for that model number. Power supply AC240V 60/50Hz or DC6V battery (built-in, operates 50 hours continuously with 1 x 350 ohm load cell). Supplied with a wall and desk bracket in stainless steel. Ramps are available as optional extras. Heavy duty scale built for weighing euro pallets. Minimises weighing times, just lower the pallet onto the U frame and read the weight. A robust pallet truck scale with 2000kg capacity . 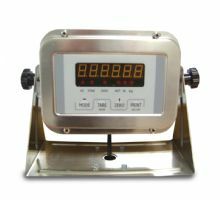 The standard truck is supplied with a basic weight indicator with bright backlit display and parts counting function. Full range tare and pre set tare are standard functions. Standard colour is Matt black . A robust pallet truck scale with 2000kg capacity. Full range tare and pre-set tare are standard functions. The on board rechargeable battery is housed in the weight indicator and is easily recharged with the AC adaptor provided.Standard width - 580mm to suit euro pallets. Other indicators with more functions are available (i.e. check-weighing, over/under functions). Price shown with Non -Approved A12SS indicator fittted. 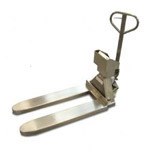 Heavy duty carcass weigher made in the UK by Turier. 304 grade stainless steel with bead blast finish as standard. Heavy duty gantry, hooks and lamb rail can be free issued or made to order in polished stainless steel. Deck size 1000 x 800mm standard, deck height raised on stainless steel table for ease of use. Capacities 300 x 0.1kg or 600 x 0.2kg approved. Stainless steel IP68 load cells as standard. Non standard sizes and capacities on request. Option of 316 grade stainless steel and satin grade or electro-polished finish.